CarGurus has 226 nationwide Huracan listings starting at $169,955. Lamborghini released the Huracán in 2014 as a replacement for its entry-level Gallardo. The Huracán is powered by a big, naturally aspirated V10 in an age when most of the competition has turned to turbocharging, and its $200,000 base price makes it roughly half the cost of Lamborghini’s range-topping V12 Aventador supercar. Like most of the company’s models, the Huracán takes its name from a Spanish fighting bull. While the Huracán still looks cutting edge and futuristic, it has aged, so for the 2018 model year, Lamborghini has injected fresh excitement into the range with a new Huracán Performante model. Starting at just under $275,000, the Huracán Performante is what Lamborghini would have called a Superleggera in the past. The Performante is lighter, sharper, more powerful, and, of course, more expensive than the standard car. Its primary competitors are thus the Ferrari 488 Speciale and McLaren 675LT. Despite this new trim, the Huracán otherwise continues on largely unchanged. All models feature all-wheel drive and come in both coupe and spider body styles, and Lamborghini also offers a less expensive and less powerful rear-wheel drive version. In typical Lamborghini fashion, the rear-drive models are designated LP 580-2 (580 horsepower, 2-wheel drive) and LP 610-4 (610 hp, 4-wheel drive), and the new Performante model is called the LP 640-4 (640 hp, 4-wheel drive). From budget urban runabouts to high-end supercars, most of major manufacturers have begun to employ smaller turbocharged engines to maximize efficiency - but not Lamborghini. The brand has proudly stuck with its large, naturally-aspirated V10 that manages no better than the low 20s in combined MPG. The engine displaces 5.2 liters and, in the rear-drive LP 580, makes 572 hp. In the all-wheel drive LP 610, on the other hand, it makes 602 hp. With the all-new Performante, Lamborghini gave the V10 a thorough revamp and added titanium intake valves, more aggressive profiles, a revised exhaust, and a less restrictive air filter. The result is even more power and torque over the standard all-wheel drive car, with 631 hp and 443 lb-ft torque. All versions of the Huracán come with a 7-speed dual-clutch automatic with paddle shifters. Manual gearboxes are no longer offered on any Lamborghini model. In addition to tweaking the engine in the Performante, Lamborghini also included new aerodynamic parts to improve grip and handling at high speeds. The Performante features a hollow rear wing mounted on hollow struts at the top of the tail. As air enters the base of those struts, it flows through the wing itself to create extra downforce. The struts also feature flaps at their base, which can alter the amount of downforce from one side of the car to another as the car corners. In addition to that clever feature, the Performante has stiffer springs, stouter anti-roll bars, and even beefed-up suspension bushings, which are paired with revised magnetorheological dampers. In total, the Performante is about 90 pounds lighter than the standard all-wheel drive Huracán. A set of truly sticky Pirelli P Zero Trofeo R tires are optional, but there’s nothing wrong with the P Zero Corsas that come standard. Power goes to all four wheels through an electronically controlled center differential. Inside the cockpit, the driver can choose between Strada, Sport, and Corsa driving modes. The cabin of any Huracán is a particularly special place even in the world of high-performance, exotic cars. The cockpit is aeronautically-inspired both in its layout and little details like the toggle switches and controls. Buyers can also order the interior in just about any color they like - as long as they’re willing to pay for it. The Huracán’s front visibility is actually quite good given the large windshield and low, short nose, but back visibility is limited; Lamborghinis are nearly always impossible to see out of when you’re looking backward. A reversing camera thus comes standard to alleviate some worry when reversing. Despite its wild looks, the Huracán has followed the trend of other contemporary supercars, becoming reasonably usable as an everyday car. Its interior is fairly spacious and comfortable enough in low speed city driving, and it has A/C and heating that actually works, which is surprisingly not always a given in Italian sports cars. It also has enough power features to feel completely modern and up-to-date. The new Performante is definitely more of a track-day weapon than the rest of the range, but even this extreme variant isn’t anywhere close to the full-body workout that past Lamborghini cars were to drive, making the Performante functional for everyday driving. What's your take on the 2018 Lamborghini Huracan? 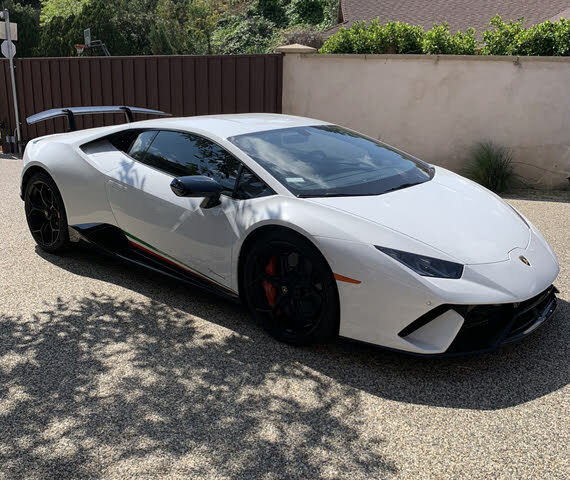 Have you driven a 2018 Lamborghini Huracan?